Major Arizona school districts in metro Phoenix and Tucson were still closed for the day on Thursday following Gov. Ducey’s signing of budget legislation providing more than $300 million in raises for many of the state’s striking teachers. Ducey signed the legislation Thursday morning soon after lawmakers approved it near the tail end of all-night House and Senate sessions. The Scottsdale Unified School District in the Phoenix suburb of Scottsdale announced less than an hour later that its schools will reopen Friday. Phoenix Union High School District spokesman Craig Pletenik said that it may reopen schools on Friday. Most school districts had cited uncertainty about when the week-old teacher walkout over pay and education funding would end when they announced Wednesday that their schools would remain closed Thursday. Arizona Gov. Doug Ducey has signed part of a state budget plan that provides more than $300 million in raises for many of the state’s striking teachers. Thursday morning’s signing came as the state House continued to debate other parts of the $10.4 billion spending plan but after the Senate concluded work on the plan. The action came after a weeklong teachers’ strike that shut down school for the great majority of the state’s 1.1 million public school students. teacher vowed to stay out until the funding package passed. Teachers will get an average 9 percent pay boost this fall and 5 percent more in each of the next two years. The budget package also provides the state’s schools will a partial restoration of nearly $400 million in recession-era cuts. The Arizona Senate has passed a $10.4 billion state budget plan that provides more than $300 million in raises for many of the state’s striking teachers after working all night. The House was still debating the budget package Thursday morning but passage was assured. The action came after a weeklong teachers’ strike that shut down school for most of the state’s 1.1 million public school students. Strike leaders had called for an end to the walkout if the budget passed Wednesday. But a daylong delay led them to essentially extend it, and many school districts ended up canceling classes for a sixth straight day Thursday. Hundreds of Arizona educators lit candles and sang hymns under the lights of the Capitol complex as lawmakers debated a state budget plan that hikes teacher pay but doesn’t address other school funding demands. Educators in red shirts cheered and jeered Wednesday night inside the legislative chambers where lawmakers were in the early stages of debating a Republican-backed $10.4 billion spending plan. Teachers have been on a statewide strike that could extend into Thursday even if lawmakers pass the budget. 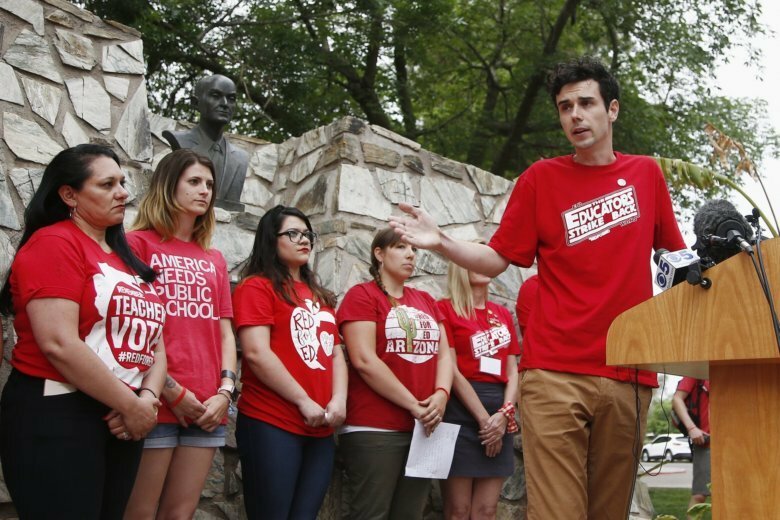 Arizona Educators United organizer Noah Karvelis said it was up to teachers and their districts whether they want to stay closed. When many teachers began to call in absences for Thursday, some districts had to close.